The Academy of Country Music is celebrating the 50th anniversary of the ACM Awards in 2015, and Country Music’s Party of the Year® is bringing a whole weekend of fun to North Texas! The music starts on April 17, 2015, with ACM Party for a Cause®: 50 Years of Music & Memories — a two-day all-star concert series at Globe Life Park (Home of the Texas Rangers) featuring all your favorite artists. Then, on April 19, 2015, the 50th Annual Academy of Country Music Awards will welcome more than 55,000 fans to AT&T Stadium (Home of the Dallas Cowboys), becoming the largest live awards show ever staged. YOU can be a part of this historic country music event! 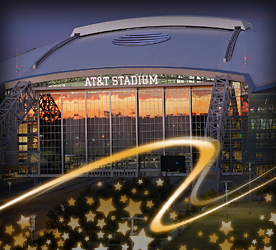 We are happy to announce that additional ticket packages are one sale NOW for the previously sold out 50th Academy of Country Music Awards on April 19, 2015 at AT&T Stadium.